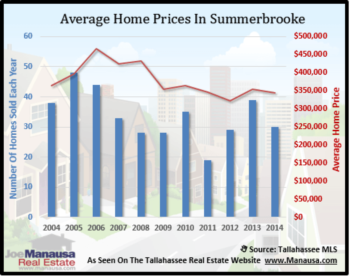 Which Home Size Is Appreciating Fastest In Tallahassee? 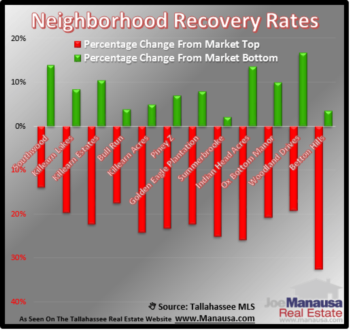 When we do a deep dive on home sales data in Tallahassee, it becomes evident quickly that some homes are doing better than others. This is not uncommon, as we know that there are many factors that impact home values. But when I decided to conduct a quick study on home prices and home values based upon home sizes, I was surprised to find one specific home size leading the market. The following graph displays the changing values of homes based upon differing ranges of home sizes. It can be a useful guide to helping homeowners estimate how their value has changed since they purchased the home. 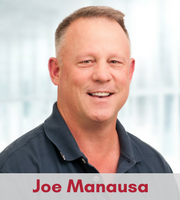 All homes sold and recorded in the Tallahassee MLS since 2003 were sorted by size (measured in heated and cooled square feet) and grouped in 500 square foot bunches starting with homes that were at least 1,000 square feet and only up to 3,500 square feet. Home values today appear to be the same as values in 2008 (blue shaded area above). Most importantly, look at what is happening with the gold line and the gray line (homes from 2,000 to 2,999 square feet). These are currently moving higher at a rate far greater than all other home sizes, and homes in the 2,500 to 2,999 range have actually crossed over the value line for the next larger homes (first time we see this happen in 15 years). Let’s say that you purchased a 2,700 square foot home in 2004 and you paid $101 per square foot. Look at the gold colored line in the graph and you’ll see that your price was below the market by roughly 13%. If you have maintained the home in roughly the same condition and the same level of updates versus the current market, it should sell for roughly 13% below the current market, meaning a price of $125 per square foot. Of course, this is not absolute. It does not account for a homeowner who "stole" a home (or conversely "overpaid"). But in general, it shows the movement of the market based upon home sizes. The following graph displays the changing prices of homes based upon differing ranges of home sizes. Home prices today appear to be the same as prices in 2008 (blue shaded area above). Let’s say that you purchased a 2,700 square foot home in 2004 and you paid $300K. Look at the gold colored line in the graph and you’ll see that your price was below the market by roughly 5%. If you have maintained the home in roughly the same condition and the same level of updates versus the current market, it should sell for roughly 5% below the current market, meaning a price of $371K. If you would like to know how much your home could fetch in today's market, just let us know. The online home valuations are fun and easy to do, but unless somebody asseses the layout and condition of your home, the valuation likely is flawed. We can do that in about 15 minutes.